Here are The Dog Food Advisor’s top 25 best dry dog foods for April 2019. 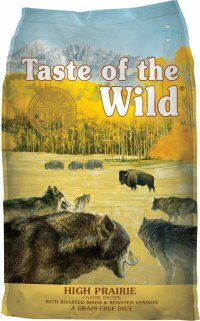 Taste of the Wild High Prairie is a 5 star grain-free recipe and one of our top picks from the Taste of the Wild product line. Summary: Taste of the Wild High Prairie contains an abundance of meat and is a nutritious choice for an adult dog. 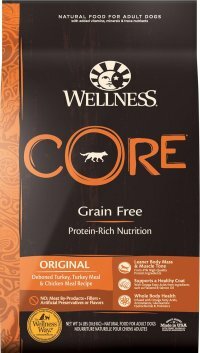 Wellness Core Original is a 5 star kibble and one of our top selections from the Wellness Core product line. Summary: Wellness Core Original’s balanced recipe and quality ingredients make it a healthy choice for an adult dog. 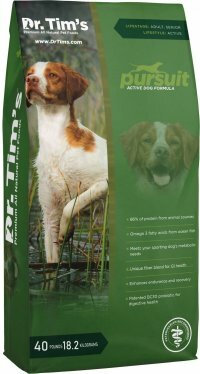 Dr. Tim’s Active Dog Pursuit Formula is a 5 star dry recipe and a top pick from the Dr. Tim’s product line. Summary: Dr. Tim’s Pursuit Active Dog Formula is loaded with meat protein and other healthy nutrients and makes an ideal choice for either a puppy or an adult. 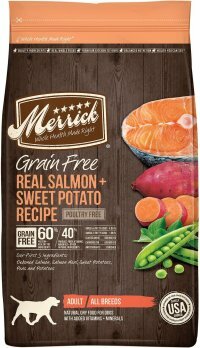 Merrick Grain Free Real Salmon and Sweet Potato is a 4.5 star kibble and one of our top picks from the Merrick Grain Free product line. Summary: Merrick Grain Free Real Salmon and Sweet Potato makes a nutritious option for an adult dog or a growing puppy. I and Love and You Naked Essentials Lamb and Bison is a 5 star dry recipe and a top selection from the I and Love and You product line. 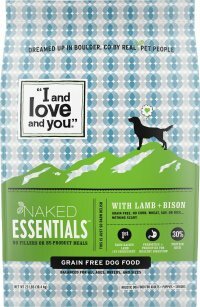 Summary: I and Love and You Naked Essentials Lamb and Bison makes a nutritious option for either an adult or a puppy. 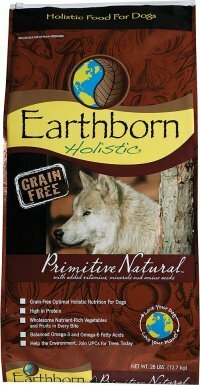 Earthborn Holistic Primitive Natural is a 5 star kibble and a popular recipe from the Earthborn Holistic product line. Summary: Earthborn Holistic Primitive Natural has a balanced nutrient profile which makes it an excellent option for both puppies and adults. Instinct Original with Real Chicken is a 5 star dry food and a top choice from the Instinct product line. 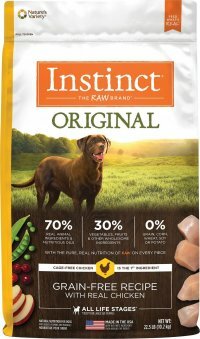 Summary: Instinct Original with Real Chicken makes an outstanding choice for your growing puppy or adult. 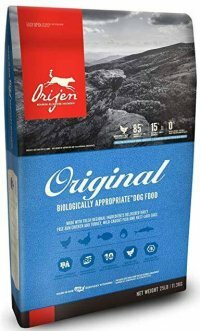 Orijen Original is a 5 star dry kibble and a great selection from the Orijen product line. Summary: Orijen Original contains an abundance of meat protein and other healthy ingredients. It’s one of the best dog foods available and a healthy choice for either puppies or adults. 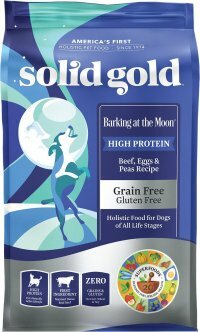 Solid Gold Barking at the Moon Beef is a 4.5 star dry product and a top pick from the Solid Gold product line. Summary: Solid Gold Barking at the Moon’s balanced recipe makes an outstanding choice for both puppies and adults. 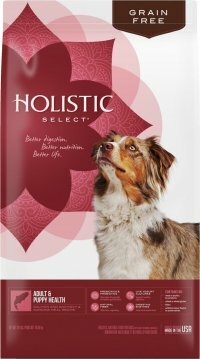 Holistic Select Grain Free Adult and Puppy Health is a 4.5 star kibble and a top choice from the Holistic Select product line. Summary: Holistic Select Grain-Free Adult and Puppy Health is a healthy choice for your adult dog or growing puppy. Nulo Freestyle Adult is a 5 star dry recipe and a top selection from the Nulo Freestyle product line. 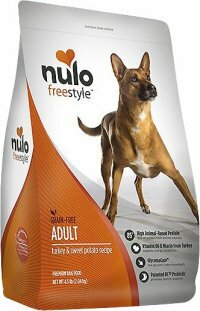 Summary: Nulo Freestyle Adult contains a significant amount of meat and makes a healthy option for an adult dog. 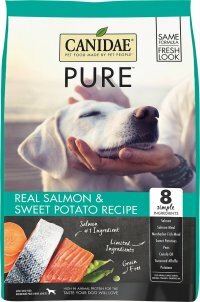 Canidae Pure Real Salmon is a 5 star dry kibble and our top choice from the Canidae Pure product line. Summary: Canidae Pure Real Salmon contains a generous amount of meat and makes a nutritious meal for an adult dog. Rachael Ray Nutrish Peak Open Range is a 4.5 star dry recipe and one of our best picks from the Rachael Ray Nutrish product line. 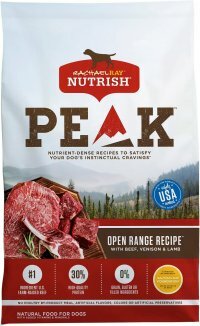 Summary: Rachael Ray Nutrish Peak Open Range is rich in meat protein and a nutritious choice for a puppy or an adult. Farmina N&D Ancestral Grain Chicken Recipe is a 5 star grain inclusive kibble and a top selection from the Farmina N&D product line. Summary: Farmina N&D Ancestral Grain Chicken sports a balanced design. It makes an excellent choice for feeding either a growing puppy or an adult. Blue Buffalo Wilderness Adult Chicken Recipe is a 4.5 star dry recipe and one of our top choices from the Blue Buffalo product line. 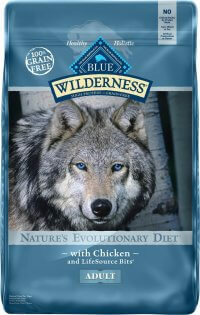 Summary: Blue Buffalo Wilderness Adult Chicken includes a meat-rich design and makes an excellent choice for feeding an adult dog. 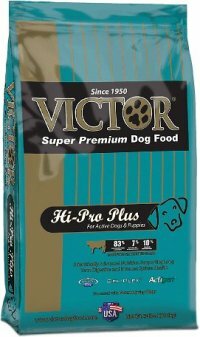 Vitor Hi-Pro Plus is a popular 5 star kibble and one of our top picks from the Victor product line. Summary: Victor Hi-Pro Plus boasts a high-protein formula packed with quality ingredients. It’s one of our top picks for feeding either puppies or adults. Annamaet Ultra is a 5 star dry recipe and top choice from the Annamaet product line. 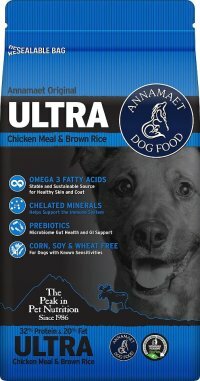 Summary: Annamaet Ultra contains the ideal blend of protein, fat and carbs carbohydrates, fats and fiber which makes it an excellent choice for a growing puppy or an adult dog. 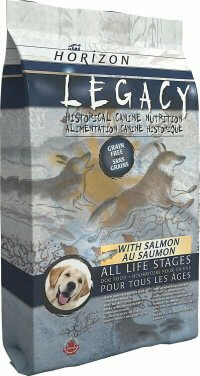 Horizon Legacy with Salmon is a 5 star dry kibble and one of our top picks from the Horizon product line. Summary: Horizon Legacy with Salmon boasts a hard-to-find GMO-free recipe and makes an outstanding choice for your puppy or adult dog. Go! 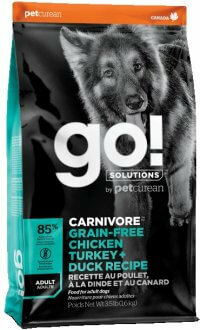 Solutions Carnivore Chicken Recipe is a 4.5 star dry dog food and one of our top picks from the Go! Solutions product line. Summary: Go! 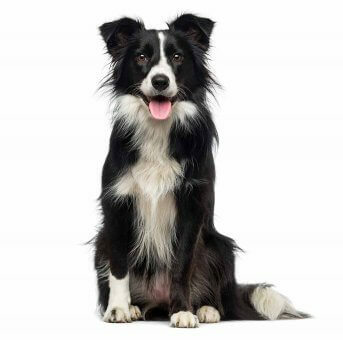 Solutions Carnivore contains a generous amount of meat and makes a healthy GMO-free choice for your adult dog. 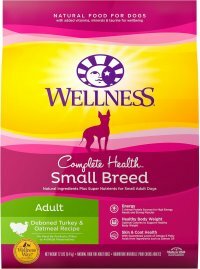 Wellness Complete Health Small Breed Adult Turkey is a 4.5 star dry recipe and a top pick from the Wellness Complete Health product line. Summary: Wellness Complete Health Small Breed Adult is rich in meat and makes a superb choice for your small breed adult dog. 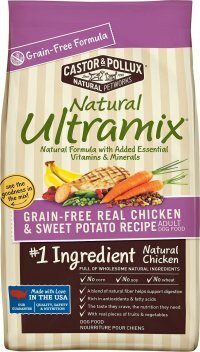 Castor and Pollux Natural Ultramix Grain-Free Chicken is a 5 star kibble and one of our top selections from the Castor and Pollux product line. Summary: Castor and Pollux Natural Ultramix Grain-Free Chicken boasts a balanced recipe and makes an outstanding choice for your adult dog. 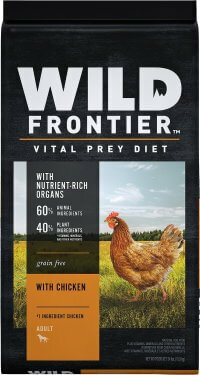 Wild Frontier with Chicken is a 4.5 star dry dog food and one of our top selections from the Wild Frontier product line. Summary: Wild Frontier with Chicken contains a generous amount of meat and makes a nutritious choice for your adult dog. Gather Free Acres Organic Free Run Chicken is a 5 star dry recipe and one of our top choices from the Gather product line. 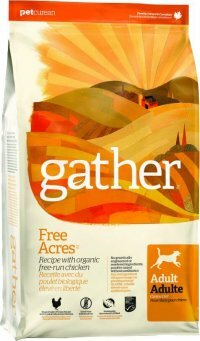 Summary: Gather Free Acres Organic Chicken includes a generous meat-based recipe and makes an excellent GMO-free option for an adult dog. 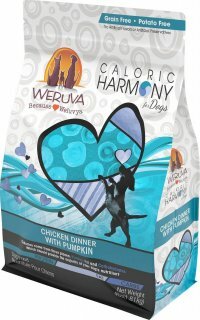 Weruva Caloric Harmony Chicken Dinner is a 5 star dry kibble and one of our top picks from the Weruva product line. Summary: Weruva Caloric Harmony Chicken Dinner boasts a meat-rich design and makes a superb choice for either an adult dog or growing puppy. 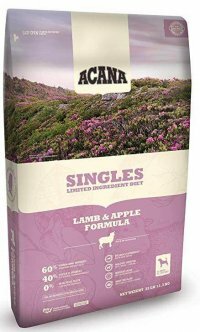 Acana Singles Lamb and Apple Formula is a 4.5 star dry product and one of our top picks from the Acana Singles product line. Summary: Acana Singles Lamb and Apple Formula is a limited ingredient, meat-rich recipe and makes a superior choice for any adult or puppy.